Not long ago I received emails from 59 countries. No, these were not money scams. They were not shady “get rich quick” offers. No pleas from dubious royal family members in need of help transferring their fortunes. These were messages from civil society activists across the globe, asking me to add their organization to a letter in support of Bolivia’s withdrawal from an obscure institution of the World Bank called the International Center for the Settlement of Investment Disputes (ICSID). In all, I received 863 sign-ons from every continent, representing a wide range of labor, environmental, religious, consumer, small farmer, human rights, women’s, development, and peace organizations. I would guess that most of the endorsing groups first heard of ICSID through the notorious Bechtel v Bolivia case. As readers of this site well know, the Democracy Center played a lead role in garnering widespread international media attention to this David v Goliath story. The short version is that Bechtel, through an international consortium called Aguas del Tunari, privatized the water system of the city of Cochabamba in the year 2000. The company almost immediately jacked up water rates to sky-high levels, provoking massive protests that became known as the “Water War.” Bechtel eventually abandoned the project, but then turned around and sued for some $50 million, using a Dutch-Bolivia bilateral investment treaty that gives private foreign investors the rights to bypass domestic courts and sue governments in international tribunals. ICSID is the most widely used facility for adjudicating such “investor-state” cases. Case dropped: The effective media and strategic work by the Democracy Center, the Coordinadora de Defensa del Agua y de la Vida, and many other groups in and outside Bolivia created enough headaches and embarrassment for Bechtel officials that they finally threw in the towel. 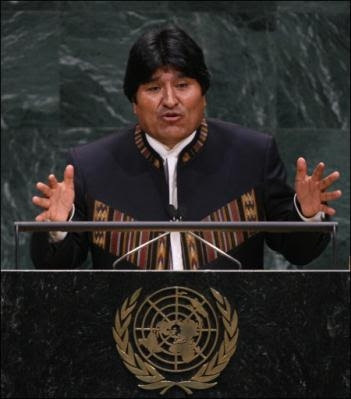 Shortly before President Evo Morales took office, Bechtel settled the case for a token sum. It is the only example to date in which public pressure succeeded in ending an ICSID case. Withdrawal from ICSID: The experience of the lengthy and eye-opening Bechtel case led the Morales administration last May to become the first country in the world to withdraw from ICSID. The government cited the court’s record of favoring narrow corporate interests over the public good and undermining national sovereignty, particularly in developing countries. However, even though Bolivian officials followed proper procedures, ICSID appears to be simply ignoring them. In October, that court registered yet another investor-state lawsuit against Bolivia, this one by Euro Telecom International, an Italian/Spanish/Dutch corporation that owns 50% of ENTEL, which provides more than 60% of the country’s telephone services. While the details of the company’s claims are a bit beside the point, it’s worth noting that the company is still operating and generating profits in Bolivia, despite its claims that the Bolivian government “destroyed” the value of its investment by setting up a commission to explore recovering control of the formerly public company and by making some regulatory changes. Educating Global Civil Society: ICSID’s decision to allow this case to proceed, despite the fact that Bolivia has withdrawn from the ICSID Convention, is outrageous. And yet, it probably would’ve gone largely unnoticed, if not for the campaign against the Bechtel lawsuit. By capturing the public’s imagination, that work helped educate global civil society about a system of investor rights that undermines democracy and human rights in favor of the interests of large corporations. And the payoff is clear in their rapid endorsement of the petition regarding the latest ICSID case against Bolivia. Worldwide, there are more than 2,500 bilateral investment treaties like the one used by Bechtel to sue Bolivia. Similar investor rights are included in virtually every U.S. free trade agreement. The Pakistan Attorney General has admitted that these treaties were often forged in his country when a foreign head of state was visiting and an “unimportant” document was needed for a photo-op signing. Only now, he says, are countries beginning to understand the implications. And many are beginning to learn the dangers of these rules the hard way. Argentina has been hit with more than 30 investor claims totaling billions of dollars, most of them over actions to lessen the pain of the country’s 2000 financial crisis. Ecuador is facing a $1 billion suit from just one company – Occidental Petroleum. Ecuadoran activists have long campaigned against the U.S. oil company for their alleged involvement in human rights abuses and operating in indigenous lands without authorization. Now that the government has canceled their contract (on a technicality involving unauthorized subcontracting), Occidental is using ICSID’s unaccountable tribunals to fight back. Rich countries are not immune either. The United States is facing a suit brought by a Canadian company over California state laws aimed at reducing the environmental damage of gold mining. And so the efforts of global corporations to use these wildly excessive rights to advance their own narrow interests continues. But the outpouring of support from around the world for a small country that is attempting to shake up the system gives hope that one day the tables may be turned.